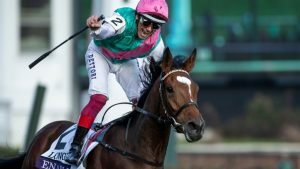 In November, 2018, Enable won the Breeders’ Cup Turf at Churchill Downs Racetrack in Louisville, Kentucky and, in so doing, made history by becoming the first winner of the Prix de l’Arc de Triomphe to win a Breeders’ Cup race in the same season. Her Timeform Annual Rating, of 134, is 6lb short of that required for her to be considered one of the truly exceptional horses of the Timeform epoch, which began in 1948, but she succeeded where eight previous winners of the Prix de l’Arc de Triomphe, including Dancing Brave in 1986, had failed. Sent off at 8/13 favourite for the Breeders’ Cup Turf, Enable was pressed throughout the final quarter of a mile by Magical, trained by Aidan O’Brien – who’d won the British Champions Fillies & Mares Stakes at Ascot two weeks earlier – but kept on strongly to win by three-quarters of a length. Her magnificent performance came less than a month after winning Europe’s premier middle-distance prize for the second year running – when reportedly only 85% fit – and was made all the more remarkable by the fact that her four-year-old campaign didn’t start until early September after a series of setbacks. Bred and owned by Prince Khalid Abdullah, trained by John Gosden and ridden, for most of her career, by Frankie Dettori, at the time of writing, Enable has won all bar one of her 11 starts and is unbeaten in seven starts over a mile and a half at the highest level. Her career earnings currently stand at in excess of £8 million and, although her future has yet to be decided, she may well stay in training as a five-year-old, with an unprecedented third win in the Prix de l’Arc de Triomphe as her main aim. John Gosden has already said, more than once, that the final decision on her retirement, or otherwise, lies with Prince Khalid but, when interviewed after the Breeders’ Cup Turf, both trainer and jockey appeared enthusiastic about running Enable as a five-year-old. Gosden may even have dropped a less-than-subtle hint when he remarked, “Maybe she’s getting better”, in his post-race interview.